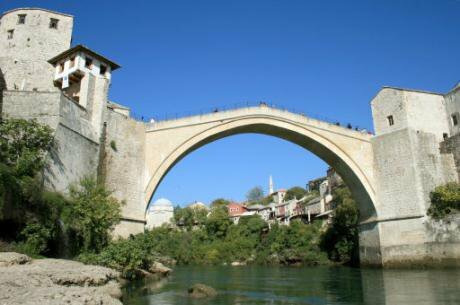 The bridge, Stari Most in Mostar was destroyed in the Bosnian War, subsequently rebuilt, and has been a part of the UNESCO world heritage list since 2005. Hauke Schroeder/Press Association. All rights reserved. In 2015, an episode of Radio Free Europe’s Perspektiva sent ripples through Bosnian press and social media. The brainchild of Sarajevo-based filmmaker Ada Sokolović, Perspektiva sends popular musicians to various ex-Yugoslav cities to talk to high school students about issues they face – nationalism, segregation, homophobia, bullying, poverty, misogyny, etc. In Bosnia, episodes often reveal both ingrained nationalist attitudes about ‘mixing’ with others, as well as students who reject such attitudes. The Mostar episode, which talked to students in both segregated and unified schools, exhibited high-school students who had never crossed Mostar’s unofficial dividing line between the east (Muslim) and west (Croat) of the city, the former Boulevard of the Revolution. Students from both sides talked about fear of what would happen if they did traverse this border. Though these sorts of divides are more or less common knowledge, a furore arose following one segment showing a Croat student who claimed that he could easily distinguish between Croats and Muslims based on appearance (claiming that the latter are darker as a rule) and that he had never once been to the ‘other’ part of town. What the episode and response to it showed (as do more recent episodes in Bosnian cities, such as Sarajevo, Jajce, Banja Luka, and Prijedor) was that the influence of wartime divides on Bosnia’s young people has been underestimated. It also seemed to demonstrate how segregated schooling had directly contributed to keeping generations born after the war physically and emotionally divided, and how deeply ingrained fairly new ideas about the unacceptable nature of ethnic mixing had become in two short decades since the war. Segregated schooling, called “two schools under one roof” (bcs. dvije škole pod jednim krovom), is common in the central and southern parts of the country primarily populated by Muslims (Bosniaks) and Croats. As the term suggests, the main features of the system are that students effectively constitute two distinct schools in one building. Students attend school in two shifts, with a long break in between to minimize contact. In some schools, they enter in different entrances or must use different stairwells, or risk disciplinary action – by teachers or other students. They use different textbooks, have different teachers, and even an entirely different administrative system. Even in so-called ‘unified’ schools such as the Mostar Gymnasium, Bosniak and Croat students are enrolled in different curricula – together in gym class and in the computer lab, but learning apart in different language, religion, geography, and history classes (what Bozic calls the ongoing ‘historiography war’). In some schools, they enter in different entrances or must use different stairwells, or risk disciplinary action. Indeed, at the heart of segregated schooling is the reification of supposedly irreconcilable identities: while Bosniak students learn Bosnian history, Croat students learn the history of neighbouring Croatia. While Bosniak students are taught the language they speak according to newly minted rules of Bosnian grammar and spelling, Croat students are taught the same language using Croatian grammatical standards. Learning in the same school and using the same curricula, proponents argue, would submit the will of one group to the other. The Minister of Education of the Central Bosnian canton, Katica Čerkez, argues that it would be unacceptable for schools to unify and thus force one language on all of the students, given that “we all have our own language.” The fact that students are already enrolling in schools dominated by ‘other’ ethnic groups due to better academic options, and thus evidently doing so comfortably in another language, apparently presents to her no irony. Many prominent linguists agree that Bosnian, Croatian, and Serbian belong to the same dialect continuum and are mutually intelligible. Using the term ‘BCS’ to collectively refer to these languages is a norm in the academic community. In Bosnia, the entire country speaks the same dialect (ijekavica), while each town has its own oft-recognizable slang, accent, and vocabulary. The “idea of mutual incomprehensibility” (Pupavac) is reinforced by the international community. In fact, one would be hard-pressed to find two people in Bosnia who could not understand each other, but the absurdity of the language question is so far gone that it is rarely questioned even by local social critics. The “idea of mutual incomprehensibility” (Pupavac) is reinforced by the international community, which sometimes treat the three dialects as distinct languages (for example, having all three options on their website) and provide translations of documents into each. The fact that minor dialectical differences have ballooned into a major stumbling block to unified education in Bosnia is thanks to two decades of concerted efforts by ruling ethnonationalist political parties to mobilize minor differences between ethnic groups. Indeed, segregated schooling in Bosnia and Herzegovina is the direct result of wartime ethnic cleansing and attempts to ethnically ‘unmix’ the Bosnian population.In Bosnia and Herzegovina, this process began with the 1991 electoral victories of ethnonationalist parties, as well as the irredentist nationalism growing in neighbouring Serbia and Croatia. In her classic text, Burn This House: The Making and Unmaking of Yugoslavia, Jasminka Udovički outlines how Slobodan Milošević and Croatian president Franjo Tuđman had by 1990 reached a tacit agreement to partition Bosnia between the two countries, each making claims about the necessity of unifying members of each ethnic group in a single state. For Tuđman, claims to Bosnian territory were focused on the borders of the fascist Independent State of Croatia which existed during the Second World War. By 1992, the Army of Bosnia and Herzegovina (ARBiH) was in conflict with the Croatian Defence Council (HVO) after a brief period of working together. The conflict was centred in Herzegovina and central Bosnia, where a majority of Bosnia’s Croat population lived. The autonomous region of Herceg-Bosnia was declared in 1991, and while its existence was never truly acknowledged, cities under its military purview adopted the Croatian flag, currency, official language, and school curriculum. While schools became ‘Croatian’, non-Croats fled or were expelled from these areas (ethnic cleansing par excellence), effectively achieving homogeneity. In zones controlled by the Army of Republika Srpska (VRS), a Serbian curriculum was imported, while in ARBiH-controlled areas a version of the prewar Bosnian system was used, modified to include Islamic education and greetings. The disintegration of a schooling system which had been functionally unified since Austro-Hungarian rule began in 1878 was well under way during the war. While war and ethnic cleansing initially separated students and ‘unmixed’ many previously multiethnic towns in the region, it was in the postwar period that segregated schooling was institutionalized. The Dayton Peace Accords (formally, the General Framework Agreement for Peace in Bosnia and Herzegovina) ended the war in 1995, creating the Serb entity (Republika Srpska) and the Muslim-Croat Federation. While Republika Srpska is a fairly unitary entity, the Federation consists of ten cantons, and myriad levels of institutional and political control which often lead to uneven applications of laws among cantons. It was in the postwar period that segregated schooling was institutionalized. After the war, as some of the two million forcibly displaced people and refugees returned to their previous homes, returnees often experienced discrimination in areas where they had effectively become minorities. In areas where Bosniaks returned to Croat-controlled territories, schools continued to teach curricula from neighbouring Croatia, while schools bore symbols of the Croat state, such as the checkerboard coat of arms. Returnees were so anxious about sending their children to such schools that many preferred either to bus their children to faraway schools where they wouldn’t be minorities, or organized informal home-schooling. As Pašalić Kreso puts it, “their options were limited to choosing between total assimilation and complete rejection,” and the majority leaned toward the latter, given how recent the conflict was. In effect, segregated schools are the result of a failure of a policy of re-integration of returnees. Former Minister of Science, Education, Culture, and Sport Fahrudin Rizvanbegović told a Bosnian portal that at the time, ‘two schools under one roof’ was a huge step forward, which was initially aimed at bringing schoolchildren together at least physically. Initially supported by the UN, OSCE, and American ambassador, it was conceived that the schools would eventually be unified in curriculum and use the same textbooks. Rizvanbegović recounts that several ‘unified’ textbooks were printed by the World Bank, only to be rejected by Croat politicians. The international community quickly found that “such a system only exacerbates segregation”  and that the model was an evident failure. What was originally conceived of as a temporary solution to get returnees enrolled in school has stubbornly remained the norm in about 57 schools in the Federation. ‘Two schools under one roof’ is most prevalent in the Central Bosnian, Herzegovina-Neretva, and Zenica-Doboj Cantons. Rather than move towards integration and reconciliation, the system has merely reinforced boundaries. A Sarajevo high school teacher told NBC News that the postwar generation was “young, intolerant, ethnically isolated and ethnically overfed,” suggesting that segregated schooling paralyzes the two-decade-old conflict in a particularly harmful way. Indeed, the model posed additional burdens upon anyone who would choose to ‘mix’ with others, something that Azra Homadžić found involves “effort, risk, and the possibility of being hurt on the long road of (re)building relationships.” What had been thought of as the ‘necessary evil’ of segregation became the goal of local politicians. In response to the inability of the two schools under one roof model to achieve its aim, its dismantling has been called for by various international actors since 2003: the Peace Implementation Council (the body responsible for enforcing the Dayton Peace Accords), the Office of the High Representative, the OSCE, the Council of Europe, and the UN Committee on Economic, Social and Cultural Rights, without success. Reforms have mainly been blocked by political parties and slowed by the country’s inefficient education system: each of the Federation’s cantons has its own ministry of education, which makes addressing the problem even more cumbersome. Reforms have mainly been blocked by political parties and slowed by the country’s inefficient education system. Local initiatives to end the model were spurred in recent years by advocacy group Vaša Prava, who lodged a discrimination suit in regards to two segregated schools in Herzegovina. In 2014, the Federation’s higher court ruled that the Herzegovina-Neretva canton had to put an end to segregated schooling – with the implication that all segregated schools in the Federation ought to do the same. The ruling has yet to be implemented, with local politicians claiming that they “don’t know” how to end segregation. The Minister of Science, Education, Culture, and Sport of the Central Bosnian Canton, Joza Jurina, told Radio Free Europe that segregation was not discriminatory, but rather a way of guaranteeing each of Bosnia’s three constituent peoples the right to schooling in their own language. The ineffectiveness of political leaders to implement laws or court rulings should not merely be ascribed to a lack of know-how. Indeed, for the ruling ethnonationalist parties of the country, ethnic segregation suits them quite well, as it solidifies ethnic divisions, breeds fear and mistrust, and leads to homogenous voting blocks. Ethnic segregation suits them quite well, as it solidifies ethnic divisions, breeds fear and mistrust, and leads to homogenous voting blocks. By insisting on the division of the Bosnian population on broad ethnic lines, parties who prey on the resulting ethnic factionalism have by and large remained popular, reinforcing these divisions yet again. For ruling parties, the current constitutional structure offers limited incentives for institutional change. Focus on divisions and differences is thus dominant not only among nationalist parties but within the international community as well as local critics. One of the poignant things about Perspektiva’s Bosnian episodes is not just the ways in which many students reify the differences between ethnic groups by using ‘us and them’ terminology, but how supposed critics of this discourse often fall into the same trap. In the Mostar episode, political scientists who comment on the students’ thoughts champion integration and unity, but primarily argue that this will teach students to respect differences (rather than, say, find similarities). The success of future models of education will depend on ending the veneration of ethnic identity and focusing on fostering a truly inclusive education system for the country as a whole – which, admittedly, seems unlikely, at least without institutional change as a whole. However, unifying schools in name while retaining separate curricula in the name of language rights or minority rights will only continue the process of ethnic unmixing that began during the war. Vanessa Pupavac argues that the promotion of linguistic human rights since the 1990s has linked language rights to identity recognition, which exacerbates ethnic divisions. She claims that in the Western Balkans, “linguistic human rights discourse, despite its conscious goal of preventing discrimination, has actually helped legitimize ethnic divisions” because nationalist politicians use language rights to assert differences between groups. Given that partition remains a looming threat, establishing Bosnia and Herzegovina as a unified and multiethnic state in which its citizens can thrive ought to be in the interests of anyone who wishes to put an end to the frozen conflict of more than two decades. Desegregating schools would be a first step towards undoing the violence of ethnic cleansing spurred by the war and the unmixing that was then inscribed into law after it. Gordana Bozic , “Reeducating the Hearts of Bosnian Students: An Essay on Some Aspects of Education in Bosnia and Herzegovina,” East European Politics and Societies 20:2, 2006. Peter Trudgill, Sociolingiustics, 4th ed. (London: Penguin Books, 2000), Snježana Kordić, Jezik i nacionalizam (Zagreb: Durieux 2010), and Ronelle Alexander, Bosnian, Croatian, Serbian: A Grammar with Sociolinguistic Commentary (Madison: University of Wisconsin Press, 2006). Vanessa Pupavac, “Discriminating language rights and politics in the post-Yugoslav states,” Patterns of Prejudice 40:2, 2006. Adila Pašalić Kreso, “The War And Post-War Impact On The Educational System Of Bosnia And Herzegovina,” International Review of Education 54, 2008. Ljuljjeta Goranci-Brkic, “Interethnic Dialogue and Cooperation for Integrated Education in BiH: The Practice and Experiences of the Nansen Dialogue Center Sarajevo,” Integrated Education in Conflicted Societies. Asim Mujkić, “We, the Citizens of Ethnopolis,” Information 14, no.1 (March 2007), p.113. Jasmin Mujanović, "The Baja Class and the Politics of Participation" in Arsenijević, Damir (ed. ), Unbribable Bosnia and Herzegovina: The Fight for the Commons (Baden-Baden: Nomos, 2014), p.138. In BiH, citizens who choose to identify as ‘Bosnian’ rather than one of the three ethnic identities are in the minority and are not structurally validated by the country’s constitutional structure. Ismet Sejfija and Danica Fink-Hafner, “Citizens’ Protest Innovations in a Consociational System: The Case of Bosnia-Herzegovina,” Teorija in Praksa 53, no.1 (2016), p.197. Sejfija and Fink-Hafner, “Citizens’ Protest Innovations,” p.186. Vanessa Pupavac, “Discriminating language rights and politics in the post-Yugoslav states,” Patterns of Prejudice 40:2, 2006."